Business Intelligence as a field has gained rapid maturity over a period of time. We are living in an era when we constantly hear buzzwords like Big Data, Prescriptive Analytics and Data Science. In the midst of these catchy phrases, the one phrase that still stands out for me is Self-Service BI. Self-Service BI is defined as an approach that enables business users to access and work with corporate data even if they do not have a background in Business Intelligence. This approach is primarily intended to reduce dependency of business users on IT for creating their reports. In the conventional reporting paradigm, a business user provided requirements for reports to IT. IT would then create these reports which business users would then use for analysis. The average turnaround time for this process takes at least 2-3 weeks. With Self-Service, the previously frustrated user can answer the same business question within a day. 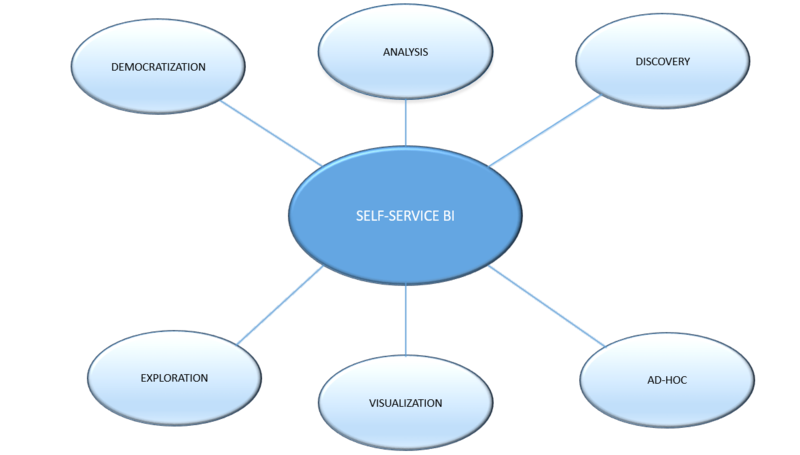 Though Self-Service BI has been relevant in this field over the past two decades, it has gained more prominence in this era with the availability of powerful visualization tools such as Tableau and MicroStrategy empowering business users to explore, visualize and analyze data by themselves. Self-Service caught my attention during my recent project with a reputed software firm. This project has transformed my thought process as a BI Consultant. Prior to this project, my understanding of Self-Service BI was limited to a narrow scope in which users would use independent data sources/silos for deriving analytics. This project’s primary requirement was to create an Enterprise level Ad-hoc reporting environment for users to create their own reports and visualizations. During the course of this project, I realized the value of enabling self-service in increasing user adoption. Earlier, I valued BI to be a niche skillset and assumed that business users will always to be dependent on me. Now, I seek ways to improve to make the reporting environment more user friendly and question myself – Can users answer these business questions themselves? Though there is no one-size-fit-all solution for Self-Service, here are few steps that I would recommend to improve self-service in an organization. Formulate our own requirements: It is naïve to expect business users to provide detailed Self-Service reporting requirements. We must be smart enough to formulate our own requirements and seek clarification from business. This is very significant in an enterprise reporting environment where a simple business question can have multiple interpretations. Let us consider a very simple example. Let us consider an Employee ‘Tom’ working for a Product Company ‘ABC’. During the year 2015, he sold Products worth 30000 dollars. This employee has worked across two departments during 2015. When a user creates a report consisting of Employee, Department and Sales for Year 2015, does he want to see one row for ‘Tom’ with total Sales of 30000 dollars and his current department or does he want to see multiple rows for Tom showing the split of Sales across departments? Addressing such nuances by seeking input from users during the initial stages of a project generates interest among the user community and drives them to providing additional feedback for other interesting scenarios. Wear the hat of the Business User: As BI Consultants, we should resist the temptation to use the more SQL-friendly interfaces and interact with the same reporting interfaces used by user groups to answer business questions. This helps us understand better how users interact with reporting interfaces and what the limitations/flaws of these interfaces are. User Friendly Navigation: As all of us know, the user traffic for a website depends on how easy it is to navigate within the website. Similarly, organizing the metadata of an Enterprise Reporting Solution into a user-friendly folder structure is critical towards the success of Self-Service BI. The naming convention of objects should be intuitive enough for users to navigate. It is also important to align metadata more with business terms that users are familiar with. Users should be able to navigate to objects with minimal supervision. The reporting environment also needs to have adequate search capabilities for users to navigate to objects they are looking for. Microsoft Excel is the tool to beat: Microsoft Excel still happens to be a business user’s favorite tool. No matter which advanced reporting technology is being used in the organization, majority of the users still end up downloading the data into excel and doing further analysis. We should challenge ourselves to prevent users from downloading data into excel for further analysis. Performance: Performance is very critical for enabling self-service in an organization. The data model may be perfect and optimized for Self-Service, but if reports take long time to execute, users are going to revert back to their standalone data silos for data analysis. It is very important for the BI team to optimize the system for better performance. 80-20 rule: Let us accept the fact that Self-Service makes an ordinary business user feel very powerful. He may start asking several interesting questions about data. Any BI solution will have limitations and not answer all interesting questions from users without IT intervention. As BI Consultants, we will need to come to terms with this reality and ensure the reporting environment will be able to meet 80 % of all possible business requirements. As for the remaining 20 % complex BI requirements, it is imperative to provide pre-defined canned solutions. BI Enablement Team: It is important for an organization to have a BI Enablement Team to increase user adoption. BI Enablement Team helps users familiarize more with reporting technologies by conducting user training sessions and workshops. From my personal experience, the critical phase for any project is the Post Go-Live Phase. During this phase, the enthusiastic business users will be exploring their new playground and have lot of questions. Not having a dedicated team to work with the users during this phase is a recipe for failure. In addition, this team can send out communications and notifications to business users about new functionalities/dashboards available in the reporting environment. Collaboration & IT Governance: The purpose of Self-Service BI is to improve the efficiency and productivity of business users by empowering them with a platform to answer questions by themselves. However, an organization’s overall productivity and efficiency gets impacted if different user groups spend time in answering the same business questions. Collaboration is essential to encourage multiple user groups to work together when they are trying to answer the same questions. Collaboration within an organization can be improved by IT Governance. IT needs to constantly monitor usage in a reporting environment, identifying candidate reports created by user groups that can be deployed to a shared environment accessible to multiple user groups. Prior to the deployment of these reports, IT can also conduct testing to assess the quality of these reports. On the other hand, business users should be trained to search for objects within a shared environment before they start creating them. As part of IT Governance, it is also important to identify long running Ad-hoc reporting requests and identify performance improvements to these requests. Though performance is crucial for enabling Self-Service BI, it is recommended to assign lower priority to Ad-hoc Reports in comparison with standard, canned reports. Many a time, BI Consultants who design enterprise reporting solutions may have the right intentions to enable self-service; however, this takes a backseat in the midst of constant pressure and stringent deadlines they face in completing deliverables. Hence, enabling Self-Service in an organization is a gradual process which requires constant monitoring by IT to identify scope for improvements. Nevertheless, Self-Service BI is going to be a futile attempt without dedicated participation from the user community showing interest in interacting with the reporting environment. Business Users should resist their temptation to use Microsoft Excel and legacy data sources; rather be more open to change and train themselves in using enterprise reporting solutions. As the saying goes, it takes two hands to clap. IT and Business need to work together to overcome the ‘Lack of Trust’ barrier and make Self-Service BI a success in an organization.